I've been all about my Midori Travelers Notebook (MTN) this week. I finally finally went to Michael's (the craft store) and found some hardware for it. You can find the bits and bobs in the jewelry making department. And see the elastic? I removed the boring brown one that came with the MTN and replaced it with a one that has some variation to the colors. You might have to look closely, but this one transitions from purple (on the left side) to blue. I'm thinking this elastic won't hold up quite as well as the Midori, but I don't mind changing colors so this won't be a big deal for me. 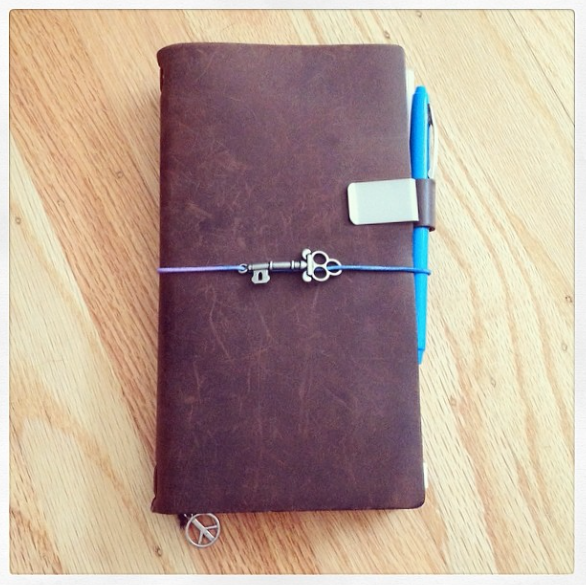 I'm not thrilled with the pen loop - it's too small for any fountain pen of size - maybe I need to stretch it a bit? Right now, I have a Stylist in there. You may wonder why I'd clip the loop to the front of the book instead of the back? I don't want the clip to scratch any surfaces I may set the Notebook upon. Here's a look at what others have been up to this week . . .
FP Quest reviewed an ink I've not tried. Informal Scribble made a beautiful mess. Pen Paper Pencil reviewed an ink that I didn't love, but can appreciate. The Pen Addict reviewed a pen that is going to find it's way to my wish list! The Unroyal Warrant talked about Scout Books - did you know about this brand? Not me. Hot Topics I've been following over on Fountain Pen Network . . . This person was looking for pen suggestions. Not an uncommon theme on FPN, but so many responses came in - probably because the writer was detailed with his questions? Scented inks - love or hate? Discuss here. That's it from me! What about you? What do you have your eye on?